Museum of Contemporary Art, Los Angeles, March 12–July 2, 2017. Kerry James Marshall: Mastry is a major retrospective of the premier American artist and focuses on the past thirty-five years of his art. The Chicago based artist is best known for his large scale works of black figures depicted within Western art historical traditions including historical tableau, landscape and portraiture. His work also includes the muralist tradition and the comic book (comics-inspired Rythm Mastr drawings, 2000–present). Marshall is a former professor at the University of Illinois, Chicago’s School of Art and Design and his knowledge of art history runs deep. References to art traditions and artists abound in his works, from the Renaissance to the contemporary. He was born before the passage of the Civil Rights Act and witnessed the Watts riots in 1965. Marshall’s abiding, driving interest is in refashioning the image of the mostly absent, or negative, image of blacks throughout the tradition of Western art over the past hundreds of years, supplanting with powerful images of deliberately dark African Americans which draw directly from the complexities of the African American experience. Kerry James Marshall’s work is in the permanent collections of the Smithsonian, the National Gallery of Art, the Art Institute of Chicago, the Metropolitan Museum of Art and many other major American museums. Kerry James Marshall: Mastry opened in Chicago at the Museum of Contemporary Art and opens at the Met Breuer on October 25. Its final stop is Los Angeles, at the MOCA, next year. Featured Image: Kerry James Marshall (American, b. 1955): Untitled, 2009. Acrylic on pvc, 61-1/8 x 72-7/8 x 3-7/8 inches. Jack Shainman Gallery, New York, NY, USA. © Kerry James Marshall. 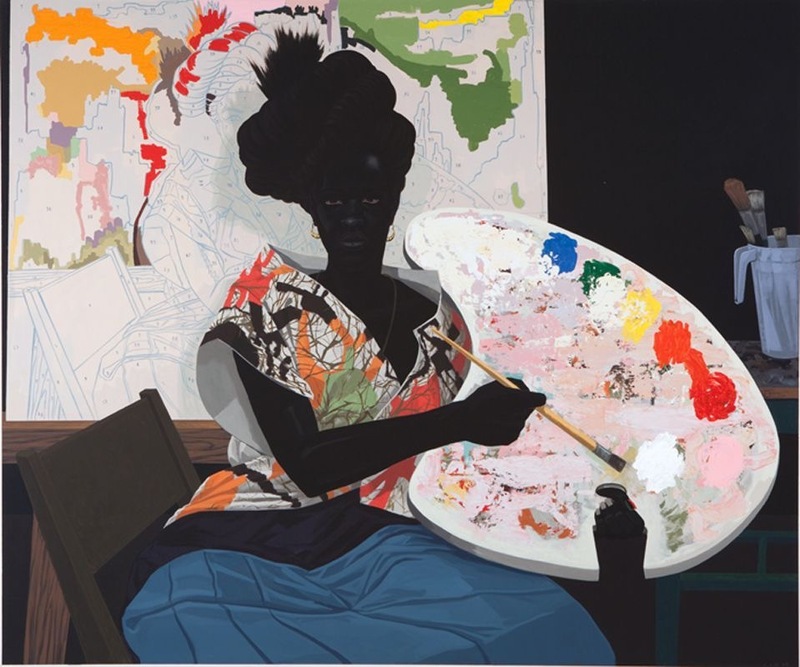 Kerry James Marshall, Untitled (Studio), 2014. Lent by The Metropolitan Museum. Kerry James Marshall, “Untitled (Studio),” 2014. The Metropolitan Museum of Art, New York, NY. © Kerry James Marshall. Kerry James Marshall, Portrait of a Curator (In Memory of Beryl Wright), 2009. Acrylic on VC; 30-7/8 x 24-7/8 x 1-7/8 inches. (78.4 x 63.1 x 4.8 cm). Courtesy of the artist and Jack Shainman Gallery, New York, © Kerry James Marshall. Kerry James Marshall, School of Beauty, School of Culture, 2012. Acrylic and glitter on unstretched canvas; 107 7/8 x 157 7/8 in. (274 x 401 cm). Collection of the Birmingham Museum of Art. © Kerry James Marshall. Kerry James Marshall (American, b. 1955): Untitled, 2009. Acrylic on pvc, 61-1/8 x 72-7/8 x 3-7/8 inches. Jack Shainman Gallery, New York, NY, USA. © Kerry James Marshall. Kerry James Marshall (American, b. 1955): Slow Dance, 1992-1993. Mixed media and acrylic on canvas, 75-1/4 x 74-1/4 inches (191.1 x 188.6 cm). David Zwirner Gallery, New York, NY. © Kerry James Marshall.